November has come to a close which means my first experience with NaNoWriMo has come to an end. I am not a NaNoWriMo winner, I fell a long way short of the desired 50,000 words coming in at 30,572 words, a far cry from the target. A post about NaNoWriMo isn't the normal sort of post for The Finer Point but during this challenge I used a lot of analogue tools and planned using a trusty Bullet Journal. In today’s post I will share this process and some of my discoveries with you. My very simple NaNoWriMo Bullet Journal. I am not a fly by the seat of my pants writer, nor was I a huge planner outlining all aspects of my story. I fell somewhere in between but in order to have some idea of where I was going and what I needed to do I created a very lose Bullet Journal to plan and track my word count. The most useful spread was the calendar. This was a simple hand drawn calendar where I planned out what I was writing on which day. This planning was important to kick off NaNoWriMo and forced me to consider the more complicated or time consuming sections of my story and tackle these on the days where I had sufficient time. At the end of each day I added my final word count in for that day. This was useful to see how I had done each day but also proved useful in figuring out if I hadn't written enough for a section. As the month went on I didn’t plan out too much on this page, it became more of a record keeping spread. 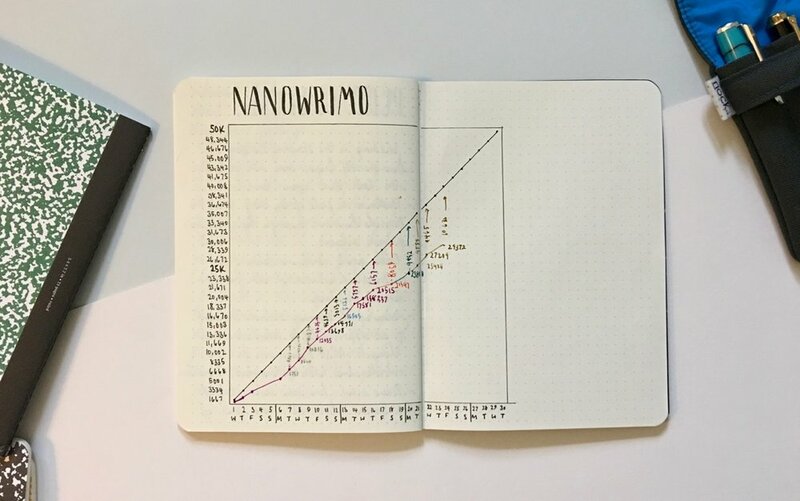 My NaNo Bullet Journal included a chart showing my word count target by day that I copied from Boho Berry. This was useful but became a bit depressing the more I fell behind. I continued to use this as a tracking tool but spreads such as this could become a little de-motivating during the month. Other pages I had in the Bullet Journal were not referenced very often but they were important in helping me keep consistency. I had plot and character outlines and lists to make sure I didn't forget anything and also knew the links between characters. The rest of the Bullet Journal was used as a brain dump to keep anything related to my story all in one notebook. I wrote the whole thing by hand. I wasn't expecting to do this at all but I actually quite enjoyed it. I had plans of using a mixture of analogue and digital tools and thought my hand could ache from too much writing. Far from it. I went through all three of my Baron Fig School Set notebooks. These were perfect as they had lined ruling, my personal favourite, and I could use a wide range of tools on the paper. I polished off my Insightful Spectre Squire refill during the month, worked my way through the School Set Archer pencils from Baron Fig and refilled several fountain pens on numerous occasions. I am not sure I have used any of my supplies that quickly before. It was great fun. I have really liked taking part in NaNoWriMo for the first time. I wrote far more than I ever expected to and at times whilst I struggled to figure out where I was going with my story, I found a way. I was a long way off the desired 50,000 word target but I am not sure that's the real purpose of this challenge. I found time most days to write, to get this story that has floated around in my head for years, down on paper, by hand. Time away from my digital tools to create something with pen and paper is really quite liberating. The one change I will make for next year, if I have a story to write, is to drink more. I am sure this would improve the quality of my writing. Bullet Journaling has become a thing for me. I have watched numerous videos and read a lot of posts about how people set up and use their bullet journals with the aim of finding my own style. I think after all this time I have found the solution that works for me. When I started out the year I had a clear idea of how I would be bullet journalling. I ordered the A6 Hobonichi Techo avec which is the smaller size of the Techos and the avec is two half year books. 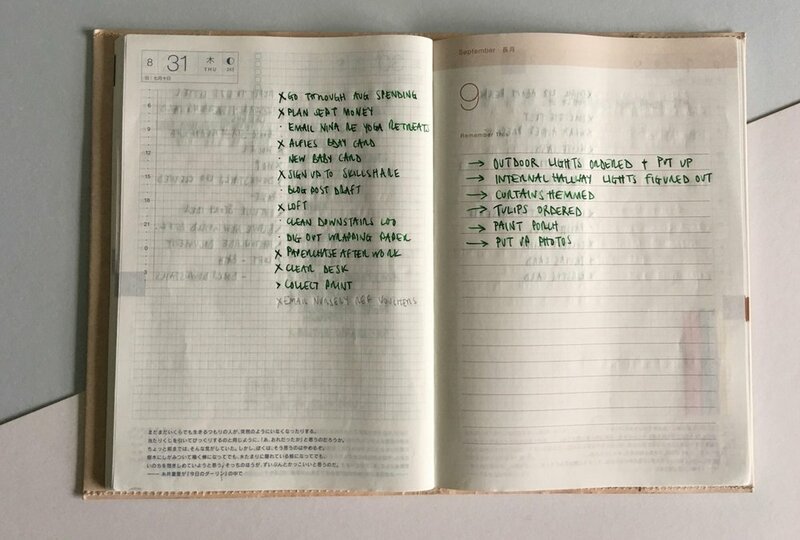 The Hobonichi Techo has the essential elements of a bullet journal - monthly pages, pre-dated daily pages and pages that are suitable for future planning. Using the Techo as my bullet journal meant that I had a planner that was literally ready to go. By March my mind started to wander and I was pining after my old Leuchtturm1917 bullet journal. Binge watching YouTube bullet journal videos pushed me towards the DIY option giving me the flexibility to change things regularly and having space to be creative. In March I set up the second half of the month creating only weekly and daily spreads and using the time to try out additional ideas such as a reading tracker and a home to do list. From April I set up the bullet journal properly and quickly found a layout from YouTuber Amanda Rach Lee that worked as I wanted it to. It was a double page spread that showed a small weekly overview on the left hand side and the remainder of the page contained my daily to dos. This weekly overview was exactly what I was looking for and it remained unchanged right through until August. There were some pages that I found I wasn’t using and I very quickly dropped. The habit tracker, time log and project pages were discarded as I wasn’t using them and they became tiresome to create. 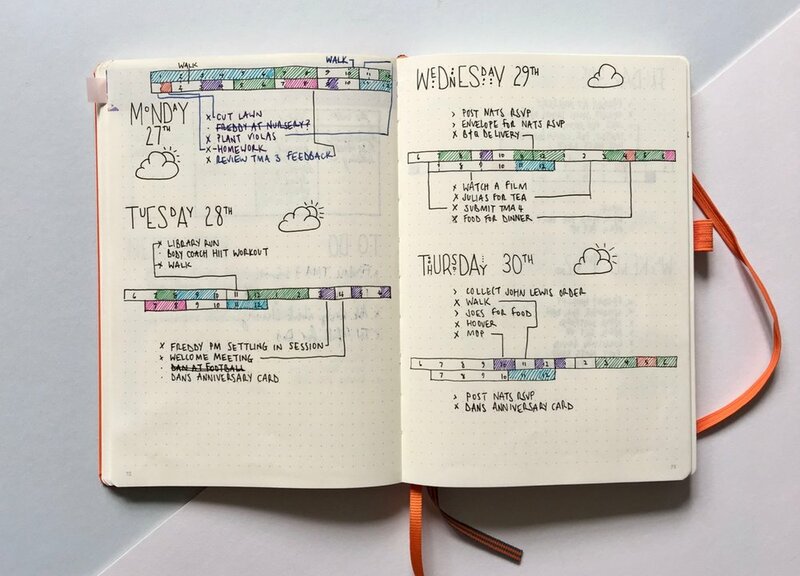 Despite being happy with the weekly layouts I found it a chore to set this up week after week and my notebook quickly started to look messy and unorganised. In August I decided to go back into my Hobonichi Techo but this time use the Cousin. I like the A5 size and appreciate the extra room but I also like the week on two-page view that you don’t get in the A6 size. I have been using these pages as a rough time tracker to monitor where my time is spent each day. I still haven’t perfected this and feel like I am trying to find the right way to use these pages but for the time being they serve a functional purpose. I use the monthly spreads as designed, to plan and note down everything that I need to remember for the month. The daily pages are the most important aspect of the bullet journal for me. I use this as a practical planner and therefore really appreciate the pre-dated pages. I use the right hand side of the page to create my to do list. Everything gets dumped in here, mostly the night before but sometimes I plan ahead and add in to do’s for further on in the week. On the left hand side of the page there is a time planning area. Most days I don’t really use this but sometimes I note down appointments here to show a loose structure to my day. It seems a little silly to deliberate how to use my planner but I love using stationery and want a system that works for me. Over the course of my bullet journaling I have come to the conclusion that I am not a decorative bullet journaler. I use this as a tool to get my life in order and dump all my to dos in one place. Because of this the Techo is perfect for me. The tomoe river paper lets me use all my fountain pens and gorgeous inks. I have found that the Cousin is the perfect size and I like having everything in one notebook. As the 2018 Hobonichi Techo planners have just been released I am now thinking about how I improve on this set-up and what I will need for next year. I am in no rush to order and will continue to see if my Techo bullet journaling sticks, but I really think I have found the best solution for me and as the cool kids say ‘planner peace’. I have been using the Leuchtturm1917 A5 hardbound notebooks for some time and I have just realised that I have never reviewed them on the blog. Today I am fixing that error. I see the Leuchtturm1917 notebooks as the Moleskine upgrade. It seems to be the notebook choice people progress to once they dip their toes in the Moleskine waters and realise how disappointed they are with the paper quality. Leuchtturm1917 notebooks are readily available through various different outlets, specialist or mainstream, and sit in a similar price range to the Moleskine notebooks. The key difference is they outperform the Moleskine notebooks in almost every way. Ok, maybe this shouldn’t be point number one in a review but I am a magpie and pretty things catch my eye. The range of colours for these notebooks is really impressive and has to be a big selling point for Leuchtturm1917. I have used a number of these notebooks over the years and each time I have bought a different colour. I am currently using the orange dot grid notebook as a bullet journal. Recently for Leuchtturms’ 100th anniversary they released three metallic colours in gold, silver and copper. The paper in the Leuchtturm1917 notebooks is an off white colour with a faint grey ruling. I have found with some other notebook brands the colour and darkness of the grid pattern too dark and therefore off putting, but with the Leuchtturm1917 notebooks the grid is faint enough that it blends into the background when you have scribbled all over the page, but dark enough to guide you. The paper quality itself is really impressive too. When testing out different pens and pencils in this notebook I have found that it can handle most things. I have successfully used fountain pens, drawing pens, coloured brush pens and pencils. With some broader nib fountain pens and wetter inks there can be some show through but the finer nib fountain pens work just fine. With gel pens, ballpoints, rollerballs and pencils this paper works perfectly. The extras you get with the Leuchtturm1917 notebook are what really make it a popular choice. At the front of the book are a few pages which are set aside as an Index. This works hand in hand with the numbered pages throughout the book. All very handy for reference purposes, or for bullet journaling. You also get two bookmarks with the newer editions of these notebooks. I have found this a really useful feature, one bookmark is never really enough. In the back of the notebook there is the handy pocket in case you need to keep hold of any bits of paper. A lot of notebooks claim they lay flat when in use, but I think Leuchtturm1917 notebooks actually do. For a notebook packing so many pages (249 plus the index) I think this is pretty impressive. It lies flat on the desk when in use and due to the elastic on the cover stays closed when you want it to. I have used these notebooks for long form writing, for note taking at work and for school, as well as for bullet journaling. I have tried a number of their different grid formats and I have always really enjoyed each different notebook I have completed. Everything about this notebook makes it a joy to use, I can’t sing their praises enough. I have used a bullet journal system for around ten months with a bit of a gap in the middle. Juggling a baby meant that my Leuchtturm1917 do-it-yourself format wasn’t manageable so since the beginning of this year I switched into a Hobonichi Techo Avec. On the whole the Techo has worked well as a bullet journal. I have utilised the space and layouts available but there are things that I have really missed using that don’t fit within this pre-structured format. The Techo has successfully housed the essentials of my bullet journal. My habit tracker is at the front of the Techo on the simple line per month view. I did consider using these pages as a future log as it felt like the natural fit, but that would have meant that my habit tracker wouldn’t have worked anywhere else. The layout on these pages work perfectly as a habit tracker. The blank space at the top of each month is where I list out each different habit I want to track. The dates are already filled out for me and the grid makes it easy to check off the different habits each day. I’ve used the monthly calendar as intended, an overview or in bullet journal language, the future log. I use this to add in appointments and its a great overview of how busy you may be over the course of a month. The daily pages are used for my daily to-do lists. These pages are a great size for me to jot down everything I need to remember, events I have on that day and tasks I need to complete. I also include little bits of information such as the weather, or during February my InCoWriMo recipients. The benefit of the Techo is I can add future tasks in easily as all the dates are already marked out. The Techo has worked as intended, a place to hold all the things that rattle around in my head and bring some form of structure to them. It has kept me semi-organised so far this year and because of that I cannot fault it. Here’s the but(s)… The thing is, now I find I have a little bit more spare time. My little person is older and I can find a bit of time each day to allow me to plan exactly as I want to. This has got me thinking about the Techo and its downsides. First up, there isn’t enough spare or blank pages in the Techo. Any collections or notes which are needed for long stretches of time don’t fit into the bullet journal. As you can see I have snuck in my reading list in two of the available spare pages but there are other collections or notes I want to keep such as a home improvements list, a projects page or a workout schedule. As it stands I can’t have them in my bullet journal, these notes float around in other notebooks and get a bit lost. I also miss decorating my previous bullet journal, the Leuchtturm1917. I liked playing around with different layouts, practicing my lettering and decorating the different pages. Using my Techo I don’t get to do any of this and whilst I could decorate some of my daily pages I don’t find myself doing it. The structure seems to stop me experimenting and trying out different things. The thing I really miss from the A6 Techo is a weekly view. The larger Cousin has this feature but the smaller A6 doesn’t. Having a weekly overview to add appointments or tasks would be really helpful. This was a spread I used a lot in my Leuchtturm1917, it gave me time to think about the upcoming week, make some notes and plan ahead. The Techo is wonderful and I have written a few reviews (see here and here), singing its praises. I thought this year using it as a bullet journal would be perfect but sadly I find myself getting a bit bored by it. It lacks the flexibility I am looking for so I have decided that in April I will be back in my Leuchtturm1917 to see if I can give this more manual bullet journal the time it needs.